Our Consumer Protection Division mediates consumer complaints against businesses; lets consumers and business owners know about consumer protection laws; issues alerts about unfair sales tactics and scams; and helps consumers find information they need to shore up their finances. Our Weights and Measures Division protects consumers by inspecting weights and measures throughout the county to make sure they’re accurate. Look for current Cuyahoga County Weights and Measures seals on gas pumps, scales used in sales, and timed devices including Laundromat dryers and air dispensers. In addition to sealing scales, the division periodically conducts sweeps to check sales prices or packaging. 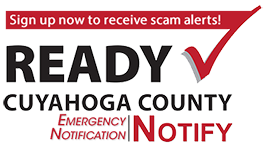 If you receive a suspicious email or phone call purporting to be from Cuyahoga County, file a scam report with the Cuyahoga County Department of Consumer Affairs.